On November 6th and 7th, 2018, generations of talented musicians converged in Los Angeles to pay tribute to an icon and trailblazer of music. It was Joni Mitchell's 75th birthday (on November 7th) and The Music Center's Dorothy Chandler Pavilion was host to the big bash. In the lobby those nights, fans chatted excitedly - discussing their favorite Joni Mitchell lyrics, reveling in the star-studded lineup that was about to pay tribute to her, and pointing out that little sign that said the event was going to be filmed. Then, the audience was treated to a command performance that transcended any other Joni Mitchell tribute in recent memory. What made the Joni 75 tribute shows so special - and what set them apart from previous tribute attempts - was Joni's surprising direct involvement. She helped select the lineup, had a hand in choosing songs, and, somewhat miraculously, she attended the festivities, clearly enjoying the celebration. It was miraculous not only in the face of her recent health setbacks - from which she has made an astounding recovery - but also in light of her feelings about glitzy, glamorous tributes. Sure, a red carpet was rolled out and celebrities roamed the lobby, but Joni 75 wasn't a typical Hollywood spectacle. No, from the first notes of Norah Jones' take on "Court and Spark," the tone was set, and reverent respect and enraptured joy rang through the hall. One by one, immeasurably talented artists with long-lasting ties to Joni - friends, frequent collaborators, and hand-picked protégés - performed classics and deep cuts from across her rich catalog to 3,000 adoring listeners. Now, audiences across North America can take part in the celebrations as Trafalgar Releasing prepares to screen The Music Center Presents Joni 75: A Birthday Celebration in hundreds of theaters for one night only, on February 7th. Filmed over those two bald-headed nights in November, the Martyn Atkins-directed feature immerses viewers into the action - placing them in the audience, on the sidelines, and backstage, to give the ultimate presentation of the landmark concert event. Audiences also get a sense of just how much Joni's work means to the performers, thanks to new interviews in which they share their personal connection to the honoree. The main draw of the film is, of course, the music. With a stunning array of legends and acolytes lined up - including James Taylor, Graham Nash, Kris Kristofferson, Emmylou Harris and Chaka Khan, as well as Seal, Diana Krall, Norah Jones, Brandi Carlile, Rufus Wainwright, Glen Hansard, and Los Lobos - there's no shortage of talent on-hand to tackle Mitchell's biggest hits and fan favorites from across her storied career. The concert kicks off with Norah Jones. On a stage adorned with sofas, miscellaneous Canadiana, iconic photos of Joni, and projections of Mitchell's own artwork, Norah Jones transfixes the audience with her breezy take on "Court and Spark," a tribute to the City of Fallen Angels. Along the way, we hear from Glen Hansard, whose grooving "Coyote" elicits bright smiles from everyone involved. Fellow Canadian Diana Krall chose two fan favorites - "For The Roses" and "Amelia." Her stripped-down and sprawling arrangements were studies in subtlety, which highlighted the eerie loneliness that underscores Joni's original recordings. Another emotional performance came from Emmylou Harris, who, following Rufus Wainwright's dramatic "Blue," performed another one of Joni's most somber songs, "The Magdalene Laundries." The song addresses the "fallen women" who were "sentenced into dreamless drudgery" in convents across Ireland after being deemed to be of ill repute. Highlighting Harris's gorgeous vocal is the beautiful blend of Greg Leisz's shimmering pedal steel guitar, Ambrose Akinmusire's tasteful trumpet, and Scarlett Rivera's mournful violin. Indeed, the stellar house band shines throughout the show. Led by music co-directors Brian Blade and Jon Cowherd - who play drums and piano, respectively - the group also features Marvin Sewell on guitar, Jeff Haynes on percussion, and Chris Thomas on bass. The players are among Joni's most frequent collaborators and favored instrumentalists. Their talents were on full display as they navigated complex and "distinctly Joni" rhythm changes and chordal movements with the fluidity of a group that seemed to even breathe as one, whether on the heartfelt ballads or on the joyous jams. Among those joyous jams was a rollicking take on "Dreamland" performed by Los Lobos with La Marisoul, Cesar Castro, and Xochi Flores. Their positively uplifting version - enough to make Joni gleeful in her seat - is made even more special as Chaka Khan joins in on vocals, just as she did on the 1977 original. Chaka Khan also delights with a sultry and funky take on the classic hit, "Help Me," plus a powerful and tender rendering of the late-career highlight, "Two Grey Rooms" later in the film. Elsewhere, James Taylor thrills with a jazzy take on "River," while Seal soars with a breathtaking "Both Sides Now." In the second half, Graham Nash takes the stage to perform his hit, "Our House," the touching 1970 love song that he wrote while living with Mitchell. Its rousing chorus has the whole room - including Joni herself - singing along. Other highlights include Norah Jones' stripped-down "Borderline," a song that remains an acute reminder of the harms of division; Glen Hansard's note-perfect take on "The Boho Dance;" Rufus Wainwright's boisterous "All I Want;" and Kris Kristofferson's touching performance of "A Case of You," featuring Brandi Carlile on guest vocals. Carlile also performed a stunning version of "Down To You," the classic Court and Spark cut which may be one of Mitchell's most vocally demanding recordings, which Carlile executed with a distinctive twang and impressive vocal agility. Next up, James Taylor performed the classic "Woodstock," recasting it as a bluesy guitar ballad, complete with guest vocals from Seal. Then, all the musicians reconvened for a raucous and celebratory "Big Yellow Taxi," a grand finale during which Joni Mitchell herself is seen on-stage, blowing out birthday candles, singing along, and dancing to the beat. 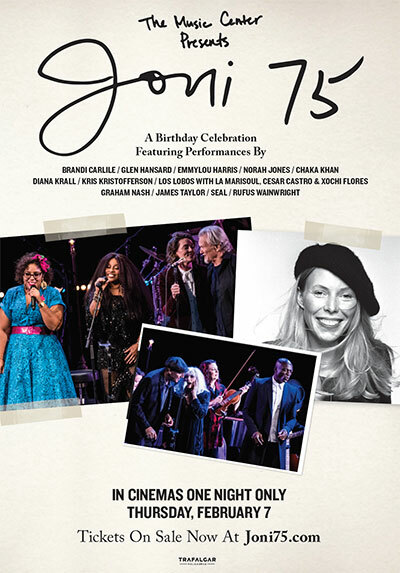 With over two hours of footage, The Music Center Presents Joni 75: A Birthday Celebration presents the night of song and celebration beautifully. But, the film goes beyond simply documenting - it captures the lasting influence of a music genius, one who has never settled and never stopped being herself. The evidence of Joni Mitchell's impact is palpable as talented musicians from across genres and generations pay tribute, with Joni herself holding court. Altogether, the film serves as a reminder of how lucky we are to live at the same time as Joni Mitchell; not to mention how fortunate it is that her 75th birthday was celebrated with such a momentous and special occasion, with cameras rolling so that fans everywhere can now testify to the expansive reach of her talents and her place in all our lives. On Joni Mitchell, Seal said, "She is an amazing singer, she has an amazing voice, she's an amazing writer, but it takes more than that. [There's] something more - something that is unfathomable, something that you can't put into words." Somehow, The Music Center Presents Joni 75: A Birthday Celebration perfectly captures that once intangible element. The Music Center Presents Joni 75: A Birthday Celebration is screening in cinemas across North America for one night only, on February 7, 2019, courtesy of Trafalgar Releasing. You can find the screening nearest you and purchase tickets at Joni75.com. This article has been viewed 2,382 times since being added on January 29, 2019.